It is a standing joke that when businessmen retire they are going to spend all their time on the golf course. It has been this way since time immemorial and many retirement gifts are golf related such as balls, gloves etc. So why do so many stop working and become addicted to the greens and the fairways? Some will tell you it is to keep them fit, others will say that they love the fact they can play their favourite game whenever they like without a pesky little thing like work get in the way, but you know what the real reason is for many? They can't get go of the competitiveness they thrive upon. If somebody you know at work is retiring and is already going on about how much they are looking forward to hours on the course then the Time For Some Golf business ecards offer a perfect, tongue in cheek way, of sending them your best wishes. 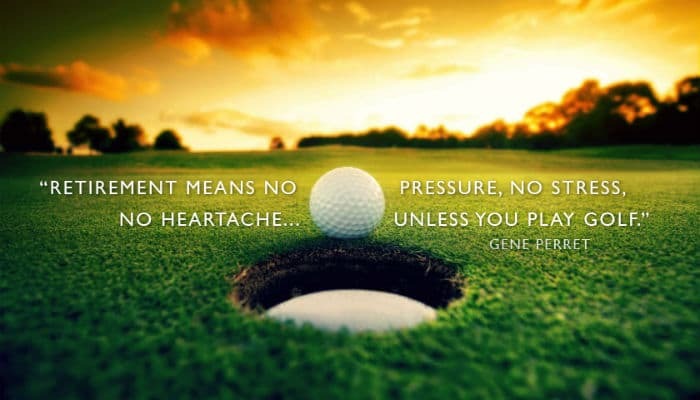 The image is of a golf ball teetering on the edge of a hole, the text is a well known quote by Gene Perret “Retirement means no pressure, no stress, no heartache.....unless you play golf”. A great last bit of office humour for the retiree to enjoy. Sending ecards this Christmas time with our amazing corporate Christmas ecards couldn’t be easier so be sure to give it a try.